There are quite a few app based rooting methods. A recent review 9 free software apps to root Android devices, points to some of them and there may be more apps, paid or otherwise. What are the pros and cons apart from above? If a device has both options - app based rooting and rooting by methods by developers, which one should I opt for? Note: I am not seeking app suggestion or recommendation. Good question, but hard to answer: there are a few more things to consider. it's not just "app based versus USB" – and even your "Difficulty in unrooting" is not necessarily the fault of "app based" in general, but rather that of a specific app causing that difficulty. From a security point of view: if there's an app that can root my device – who says another app doesn't just do that without my consent? We all know there's malware out there doing exactly that (in order to integrate itself as system app, to be protected against factory-reset). However, if there's no such app (and in the hope that's because it cannot be done by an app on this device/ROM), it's much harder for such malware. If then there's an easy method via USB, I feel a little safer :) It's rather unlikely some other app manages to attach an USB cable, download something to my computer, and runs that combo to do harm. So above might count as "contra app-based" – but if such an app already exists for the device in question, there's not much we can do about. Even if we say "it's safer the other way round", that doesn't protect us against #2. Sure, we can check that before buying a device – but who says such an app doesn't pop up the day after? There are a few advantages to rooting using the official process. It's officially supported on many phones. This means you can use a process that's documented by the manufacturer, and tools from an official source, or a trustworthy third party (CWM or TWRP), instead of having to run a tool that you got from some dodgy website. Because it's officially supported, most of the time, a system update won't change the process, so you don't need to go looking around for "the latest" rooting method. In contrast, software updates tend to patch vulnerabilities, so exploit methods will often stop working after an update. Because of the above, after you "soft root" you might be tempted to not install a system update, because that update patches the vulnerability and stops your rooting method working. With the official process, there's no reason to stay on an old, vulnerable version. As well as the convenience of a one-click method (mentioned in the question), there are some other advantages of doing it that way instead. Unlocking the bootloader to "hard root" wipes the phone, so you have to set things up again and restore data from backup. Typically "soft rooting" via a vulnerability doesn't need to wipe the phone, and that can be a lot more convenient. Because rooting modifies the system partition, typically you can't do an OTA update afterwards: the updater recognises the system is modified, and bails out. But some "soft root" methods on some phones avoid this problem, so you can do an OTA update without having to unroot or flash a new system image. This is also a bit easier. Either way, you'll still have to root again after an update. Since you don't have to unlock the bootloader, there's no temptation to leave it unlocked. This has the security benefit that people can't flash new ROMs to your phone (e.g. if it is stolen and they want to circumvent the screen lock or factory reset protection). What Beeshyams says about security is important, but to my mind it's irrelevant to the question. It's good to point out or remind people that every "soft rooting" method is exploiting a security vulnerability, and malware could use just the same vulnerability to install rootkits on your phone. However, the vulnerability is there whether you use it or not. The security risk comes from the possibility of the rooting method. Rooting your phone by exploiting the vulnerability doesn't make it more exploitable, or worse. If your phone can be rooted by a rooting app/exploit, then it is vulnerable to malware. This is true just the same regardless of whether you root it or what method you use. Not using the exploit (by doing a "hard root" instead, or just by not rooting) will not protect you from malware, nor will it reduce your exposure. What is Soft Root and Hard Root? Even though legitimate, many convenient one-click root methods operate by exploiting vulnerabilities in the Android system. If not carefully controlled, such exploits can be abused by malware author to gain unauthorized root privilege. As described in the Android Malware Genome Project , 36.7% ( of 1260 ) malware samples had embedded at least one root exploit. These well-engineered exploits are not well protected, it is extremely dangerous if they fall in the wrong hands. Who are major root providers and broadly, how does it work? What are the types of root expolits ? 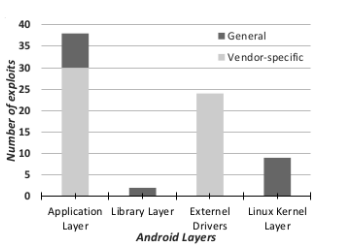 Vendor-Specific Kernel or Drivers: Vendors either customize the kernel (e.g., Qualcomm’s custom Linux kernel branch) or provide vendor-specific device drivers for various peripherals (e.g., camera, sound). Such code runs inside the kernel space and the compromise of which can also lead to full control over the device. How difficult is it to lay your hands on Exploit (Source or Binary) ? How do these exploits work? Asking the user to boot into recovery at least once . Asking the user to manually put the device into “battery saving” mode . The exploit can successfully modify a setting in local.prop which enables root for adb shell only. None or permission: (44 out of 78 studied) The exploits in this category have no hard requirements, however, some of them may require certain Android permissions like READ LOGS in order for the process owner to be placed in certain user group. Can these exploits be detected by Anti-Virus ? Original exploit fetched directly from providers servers, with packing and tamper-detection on. Unpacked exploit, which will expose all actual exploit logic to anti-virus products. Re-packed exploit with tamper-detection disabled. Not the answer you're looking for? Browse other questions tagged rooting security malware unrooting antivirus or ask your own question. Why are the rooting apps not working anymore? Do i need the internet to root my android device? What is a safe way to root a device ? Is there a way to log into and root my device without using ADB? I tried every method and failed to root my Asus MeMo Pad Me172v. Anyone know some other methods? Is It Safe To Root A Samsung Galaxy S5 (or other applicable Android devices) using Geohot's Towel Root Method? Does Android's implementation of SELinux's MAC inhibit apps with root privileges from accessing other app's data? Is the “Remote Application Removal Feature” also effective for apps from samsung and other alternative stores? What are the different rooting methods? and what are the differences between them?